The moon Umbriel, with a diameter of 727 miles, is the third largest of the five main moons of Uranus and also the third in line as you move away from the planet. It lies about 165,000 miles out and has an orbital time of just over four days. For some reason, it is by far the darkest of the Uranian main moons, only reflecting about half as much light as Ariel. The cause of this is not known. The moon Umbriel has only ever been closely observed once, by Voyager 2 in 1986. At the time, only 40% of its surface was visible and a smaller proportion than that was photographed with sufficient quality for analysis. 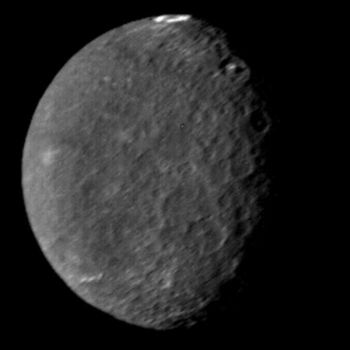 What is known for certain is that Umbriel is one of the most heavily cratered moons of Uranus, second only to Oberon. Of these craters, there are 13 to date that have been named and they range in size from the smallest, Fin, which is about 27 miles across, to Wokolo, with an impressive diameter of 130 miles. In the image above, you can see a white spot at the top of the moon. This is the crater Wunda, 81 miles across. Its centre is filled with a deposit of bright material that no-one can identify or account for. 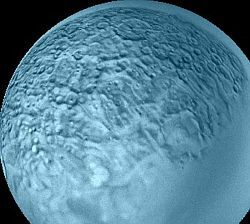 This false-colour image of Umbriel shows quite nicely another of its surface features - the polygons. These are huge dark patches that can be hundreds of miles across and are distributed pretty much evenly over the moon's entire surface. Despite this image making the moon blue, it does actually have a faint blue tint. The leading hemisphere also shows a hint of redness. As the moon is known to be reasonably dense, it is thought that it is comprised of 60% water ice, with the rest of its mass being a rocky core. Other possible components of the core could be heavy organic compounds.